You CAN recover your outdoor chairs. What is missing from this picture? ME ! I should be sitting in that chair soaking up the sun. Oh well.. It’s almost the weekend. 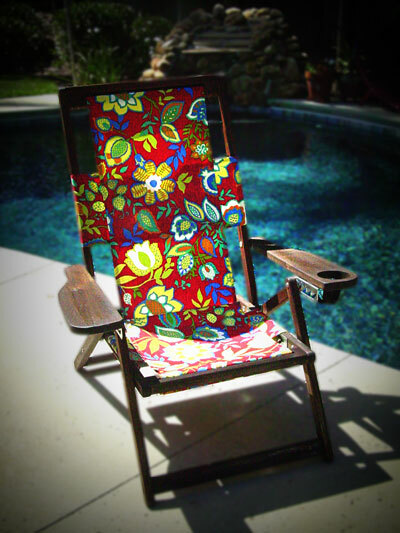 If you have hesitated to redo an old backyard chair, I want to encourage you to do it! This old chair was making my entire deck look raggedy and faded, but a quick facelift made all of the difference. My hubby took the teak cleaner out and scrubbed the wood and I took the old cover and cut a new one. It only took a couple of quick straight seams and ta da, it was done. So don’t delay, cover your chair today. It will make you happy. Little pink posy with dots. Whew! 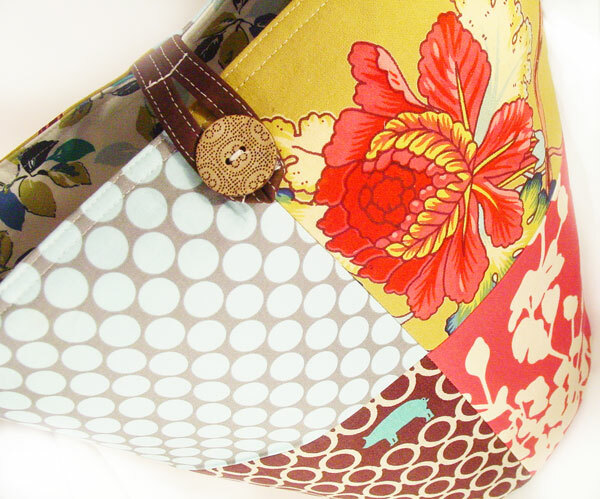 I have had an idea in my head for this bag for a while, but it was a tough pattern to create. 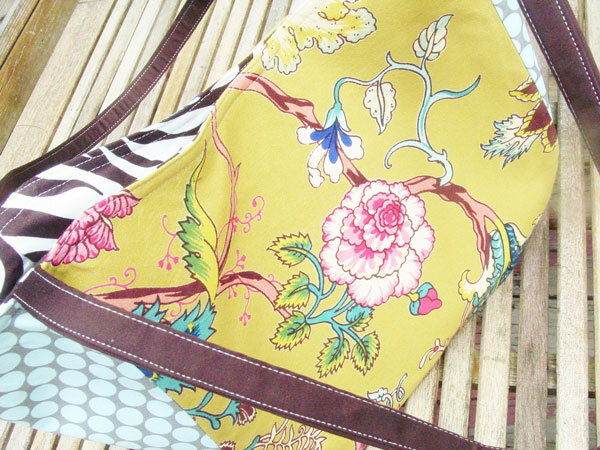 (for me that is) I’ll be making this bag with or without zippers. In fact, I did make one for myself without a zipper. Pretty exciting, I never carry the newest bags. But I forced myself to make two at one time so I could. 🙂 I’ll post that photo too. What I love about carrying the magnetic closure version of this bag is when I want to dig in there to locate something it opens up really wide. Kind of like a bucket. Just my speed. 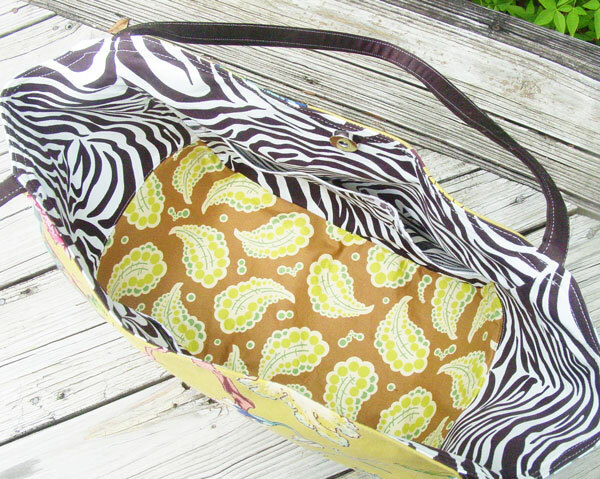 In fact, way way back when I needed a diaper bag I would have used this rather than the ugly versions we had! See how I can fill the insides …. It will never be this empty again! When I spotted a delightful green tablecloth, I was determined to use it. No matter that it doesn’t work in my kitchen or dining room. I love this fabric and I want it!! 🙂 I tend to do that a lot, find an item I have no use for and refashion it into something I can use. So my new tablecloth is now turning into purses! I even broke down and made one for my own personal use. I feel so extravagant! 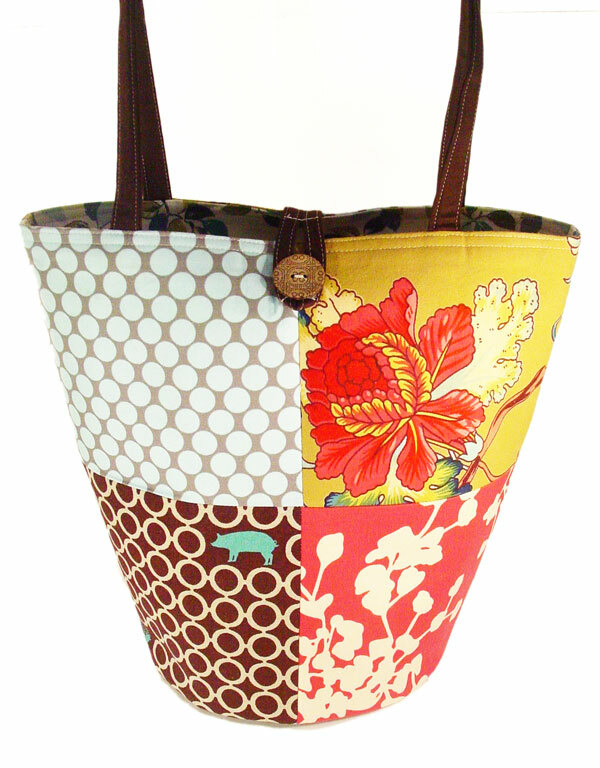 Here is the Katy Bag made in part from my new tablecloth. I couldn’t resist taking pics of my pup today. 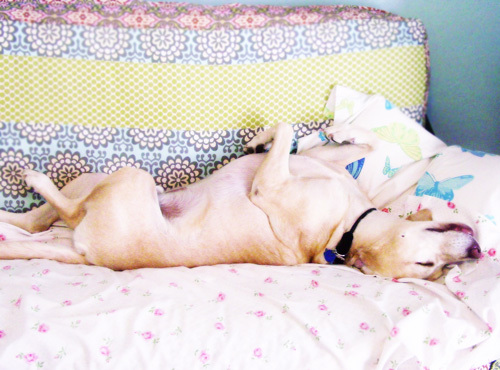 He is the ultimate relaxer. He might be fast asleep, but that radar ear is always listening. 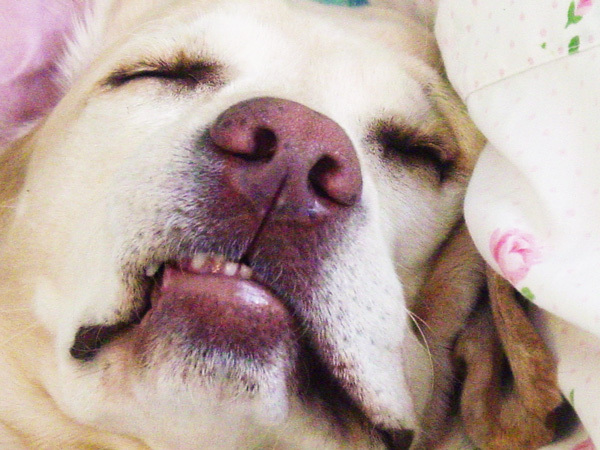 He seems to be dreaming about orthodontics. Ooops, I have been caught.